While the strand length varied the menat consisted of three parts: the aegis (shield), which was usually a series of bead strands strung together and draped across the chest; the strand, though the length of this varied; and the counterpoise, which was large enough to serve as a handle for shaking the menat and as a counterweight for the menat. 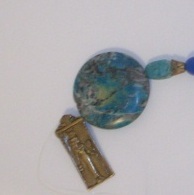 The materials varied, but faience was usually the material of choice. I didn’t have a proper counterweight nor a pendant large enough when I made this menat, so I combined a couple of pendants to get the desired length. If you can get a hold of a proper counterpoise or a large enough pendant use it. It’s also worth noting it’s important to have a long enough counterpoise because the aegis will droop otherwise. I know this because when I’ve worn this menat I made it too long to wear it with the counterpoise in the back (when I wrap it around I end up with the counterpoise in the front). I actually made my menat strand 3 1/2 feet, though I think because of my oversight 2 1/2 feet (maybe even 2 feet) should suffice. 1. Cut a strand of nylon thread roughly over 1 1/2 feet. The extra length will be used to tie loops. 2. Make a small loop on one end. Trim excess from the loop. TIP: If the loop is hard to make first loop it around something like part of a pen cap, then make a square knot under the loop. 3. 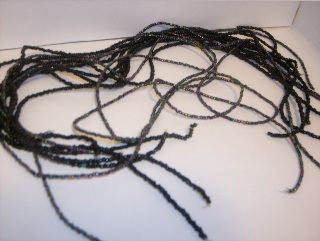 String the seed beads until the total length of the beads is 1 1/2 feet. Tie the other loop like before. 4. Repeat steps 1-3 until there are at least 10-12 strands (though I think for this project I made something around 15). These will serve as the aegis. 5. Gather all the strands. 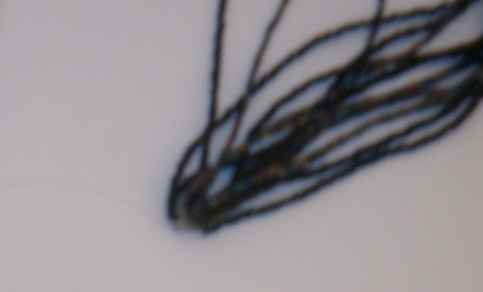 Take the nylon thread for the strand and thread each loop. 6. Tie a knot when the loops on one end are threaded. I tied several knots to ensure it would stay. 7. Thread the pendant cap so the open end will face the aegis. 8. 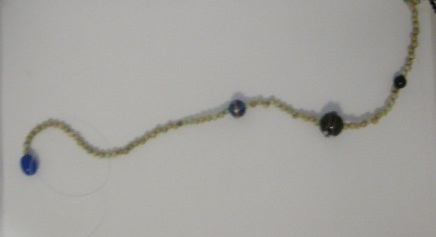 Bead until the center is reached. 9. 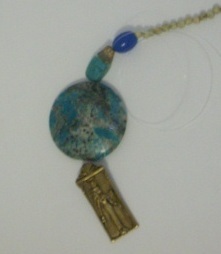 Thread the second the pendant cap so the open end faced the pendants. 10. 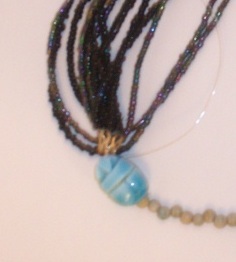 Thread the bead and pendants through. 11. Thread through the pendants again. 12. 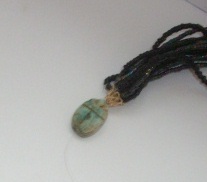 Thread through the bead and pendant cap. 13. Bead as on the other side. Thread the final pendant cap so the open end faced the other end faces the aegis. Take the end loops and thread together like the other side of the aegis. 14. Thread the left over thread back through the pendant cap. Tie a few knots, trim as needed. This is a wonderful piece for ritual use. 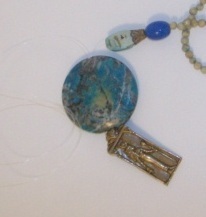 When I use it in ritual I gather up the strand and the counterpoise, letting the aegis hang. Shake gently, as if shaking a fist at someone. 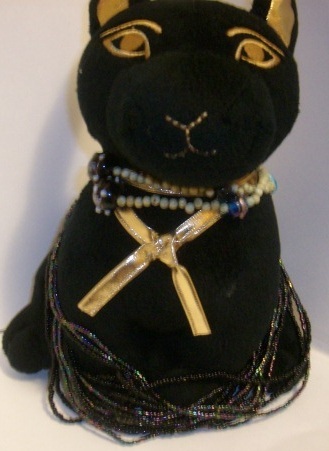 Categories: Craft Friday | Tags: Craft Friday, Kemetic, menat, NeoPagan, shrine, tools | Permalink. I thought I’d continue with my thoughts last week about overreacting and acting aggressively to revisit an old post. Honestly I feel this post is a little moot on some levels, but I know the topic is timeless at the same time. Knee-jerk reactions are important for everyone to examine when reading things, especially online. It is especially important to watch our reaction to things during tough times in our life. It also means we have to be more aware of what we put into our heads and improve media literacy. What sparked the initial post was dealing for the umpteenth time with a circulated link about a plea by an Islamic group to destroy the Great Pyramids. The reaction ranged from hand wringing to screams of persecution. It’s been revealed to be a hoax since then. Honestly, I had my criticisms of the original article since there were some dubious links and was too emotionally charged to fully convey that – even if the call is true – it’s a bad idea to follow. It also goes in the face of the Egyptians who tried to protect their heritage even during their revolution, the attempts to repatriate artifacts, and even an attempt to copyright Ancient Egyptian replicas. Tourism focused on its ancient history is very important to their economy. When I and others pointed to links confirming the hoax and pointing out the very points I cited we were met with extreme opposition. I’m positive I threw “islamophobia” out there a few times. The information we provided didn’t feed their emotional state; it was so contrary to their media source and agenda that cognitive dissonance ensued. What pains me to see is that it could have taken a few minutes to think this through. Yes, there are extremists that will do these things, but they exist everywhere. I’m sure I can dig a bit and find some clergy who feel Ancient American sites should be destroyed (as if Manifest Destiny and other campaigns didn’t help that along). It actually demonstrates a point I made in an earlier article about the pitfalls about following one’s emotions without thinking. That’s not to say the Abrahamic faith-based groups that do these things are non-existent, but they’re not as prominent as one thinks. I can tell you from experience a good portion of the time the groups that act this way aren’t fully educated about Pagans and they’re acting on their own knee-jerk reactions. These knee-jerk reactions come from their own fears. Knee-jerk reactions such as these are a side effect of fear-mongering. It’s not shameful, but it is a human trait exploited so often it’s integral to keep it in check when faced with media sensationalism. It’s supposed to shock you, it’s supposed to stir up your emotions, and it’s supposed to place us towards a certain agenda. This is where fear-mongering becomes problematic. People in an emotional state sometimes surrender reasoning for the sake of security (or the feeling at least). This tends to stir up hatred towards a targeted group. I’ve found in my experience fear-mongering and hate-mongering tend to go hand in hand. However, there are still ways to mitigate our knee-jerk reactions. One of the things to understand right off the bat is everyone has an agenda, myself included. For example, this blog post has an agenda to explain everything you read has some agenda and will use a form of sensationalism to incite a desired outcome. That’s the hardest part because it means every bit of media to which we expose ourselves–even those from our own groups–may have a questionable agenda exposed with some scrutiny. The best defense against knee-jerk reactions from media sensationalism, though, is to improve media literacy. Media Smarts has a website with incredible resources on how to hone media literacy. Don’t let the target age for their learning tools deter you; the information is still invaluable to all ages. As with most things I stress on my blog awareness and knowledge are key in combating some of these extremes. It takes practice, but it’s worth not panicking over every misquoted article about the Pope allegedly targeting Pagans with pancakes (yes, I used alliteration on purpose). It takes effort to stop, process the article read without emotion, and analyze the piece. I assure it’s worth it. It has saved me anxiety and isolation issues doing this. It may also reveal some things about sources you may not like, such as an author purposefully inciting fear in order to rally people against a Catholic organization or externalize resentments about Catholicism the author harbors. Ultimately, the way to combat knee-jerk reactions is to improve critical thinking skills. 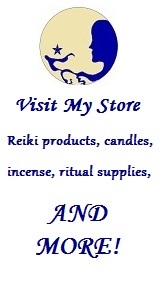 Categories: New Perspective | Tags: ideas, internet, Kemetic, life lessons, Ma'at, NeoPagan, simple, value, venting | Permalink. This is one of the more interesting translations for me. In one translation of this passage I see that it is translated as “I have not been aggressive” with the emphasis on acting like a warrior. I’ve read that priests didn’t always look favorably upon warriors in Ancient Egypt, and when combined with the associations of Nit to Sais probably influence this confession somewhat if this translation is accurate. There are probably a few reasons for it. Serving in the military, just like today, is tough. With that toughness comes aggression which the Egyptians utilized, which came out even after the battle was over and plundering began. I’m sure some will argue about how “all’s fair in love and war”, but the problem comes not when aggression is used in a fight or war but after aggression is no longer necessary. It’s a problem when the aggression is a way of overreacting. Aggression is one which is a big challenge I feel for modern Kemeticists. If one lives in America there’s a massive violent culture. It’s not even about the media with violence, but in everyday interactions. Aggression also doesn’t have to be physically violent, just hostile. I’ve also found when used as a form of overreacting it leads to more problems with even innocuous situations. When I lived in Virgina a simple“excuse me” would result in a glare from the offended party. Asking a fast food establishment about my order (I had waited half an hour and people who ordered after me were served and given their food) resulted in the workers yelling, and one time a worker yelled profanities at me. One woman was even physically threatened for complaining about poor service at a restaurant in the very town where I lived. It honestly bothered me how quick to anger the people seemed to be. What type of life leads to this behavior? Why is this culture so oriented on violence to solve even the smallest issues? I researched some things and came to the conclusion most of what I witnessed stemmed from a culture of honor. The concept revolves around how people take “the law” (it’s not so much actual laws as much as personal codes) into their own hands because the resources aren’t there to enforce laws or law enforcement is unreliable, and people are in survival mode. When factoring in how Prince Edward County was the poorest country in Virginia at the time it explains some of the aggression. Even if it wasn’t trying to gather the most resources the stress from trying to make ends meet is stressful enough. Watching ourselves is important because when we reach that breaking point it can lead to overreaction at mildest. When we overreact more often than not we’re aggressive. With aggression we see the extremes of our behavior and their matching consequences. More often than not I’ve seen people respond to “fight or flight” with the former. Even after the physical wounds heal it leaves an imprint on the mind. People will react to any similar situation sometimes as if the previous incident was happening again. Aggression isn’t just a momentary feeling but cumulative in my experience. Don’t engage. Not every situation requires aggressive action. Not every situation requires a response even. The Maxims of Ptahhotep asserts one shouldn’t argue with superiors nor inferiors. Given the context of why it shouldn’t be done it works out; superiors may have the ability to make one’s life difficult and inferiors were viewed as uneducated during Ptahhotep’s time, so arguing with either looked disfavorable and undermined oneself. I like to look at it with the latter rather than those of lower rank those who are beyond reasoning. Let people acting in an unsavory manner stupefy themselves. Stop and look at the situation. There may be other factors to consider. The other person may have reached their limit and you were in the way. Maybe the people at the fast food places I mentioned were tired and overworked when I asked. Maybe the waitress at the restaurant was on the verge of getting fired and was stressed. That doesn’t make the behavior acceptable, but it does make a situation more approachable. Sometimes when analyzing the situation we’re not as innocent in the dealing of things as well. What seems like gentle teasing may be the last straw for someone. If it’s possible to speak with the person when both you and the other person are calm, do it. However, we also aren’t capable of being reasonable creatures all the time. There’s a solution for that too. Remove yourself from the situation. If possible, just leave the situation. Online this can be a little more complicated because people sometimes like to follow an individual over several sites, threads, et cetera. There are also situations where an individual may follow you, as I’ve seen often in road rage. This is why when people are overreacting and aggressive there are other options. Call the proper authorities. I’ve had to call the police on people who got violent because I knew I couldn’t handle the situation that spiraled out of control. Sometimes calling upon an authority figure isn’t the police but a moderator. Whoever is supposed to be an authority in the situation should be notified if the situation is beyond normal handling. Treat aggression as a last resort. If the person is violent, you can’t get away, and it requires immediate response I feel aggression is reasonable. I’ve used it when I was completely cornered and I was physically harmed. I fought my way out and grabbed a phone to contact authorities. I’ve also used aggression to escape an abduction. When one looks at a situation calmly and not resort to unnecessary knee-jerk reactions some things become clearer and better off. I’ve found walking away from some online communities was better for my peace of mind than constantly bickering with people to “prove a point”. I’ve found some people can’t be bothered with because they let one aspect of their life define them, bet it a positive or negative aspect. I’ve found there’s no helping them, but awareness of these things helped me act accordingly. Categories: Life Lessons, My Way of Ma'at | Tags: 42 negative confessions, aggression, fighting, internet, Kemetic, life lessons, living, Ma'at, NeoPagan, overreacting, reason | Permalink.